I recently dressed my loom with a dummy warp for a workshop and thought I would take progress pictures to share with those who haven’t dressed their loom from front to back before. Of course the first thing you have to do before dressing your loom is to decide on a draft. Then pick out the warp and weft materials and determine the sett you need to be to create the type of fabric you want to make. 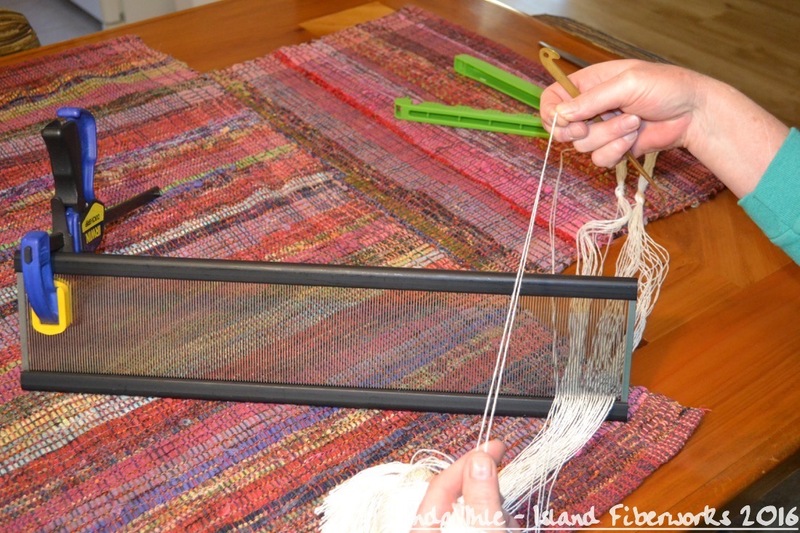 From there you wind your warp and choose the proper reed. What I’m about to describe is assuming you’ve already done those things. 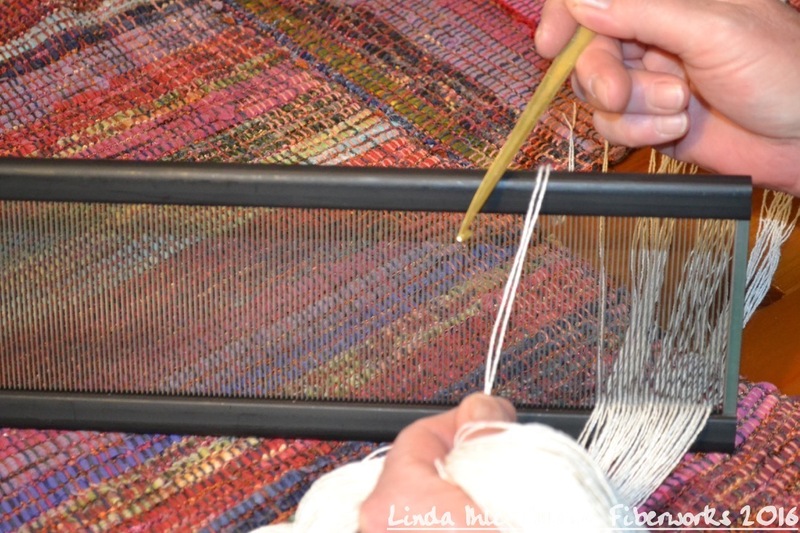 For this project I was dressing my loom for a double weave workshop and I wanted to tie on stripes of hand painted warps mixed with solids. My “dummy” warp is a warp that I wound with some 6/2 bamboo that I had all ready to wind with my paddle so making the warp was quick and easy. It was approximately 2 yards long, 420 threads, and I’m threading it 2 per dent in a 12 dent reed. A “dummy” warp could also refer to the remnants of a warp that a loom has been previously dressed with, cut off in front of the reed, that you intend to tie a new warp on to. To start, I like to get one of my Quick Grip clamps and use it as a reed stand on my dining room table. This way I can sit comfortably with the reed at just the right height for me while I thread it. 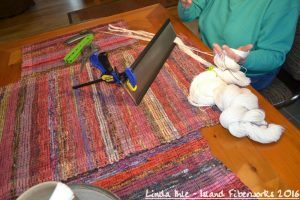 And just so you know, I love my Quick Grip clamps and find them useful for all sorts of weaving situations. Definitely one of my favorite tools and one that I think every weaver should have a pair of. I like to have all my tools and the phone within easy reach. The most important tool to have handy in my opinion is something to quickly secure the cross with should you get interrupted and have to stop. I’m using a chip clip but masking tape works well too. 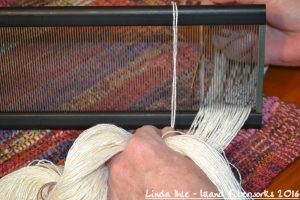 The main thing is to place the side of the warp that you’re threading from “up” and to be sure that you start threading from the “up” side where you left off, when you start again. Once I’m set up at the table I undo the end of the warp and find the cross. Then I cut open the loop and remove any knots from where I stopped and started winding the warp chain. I cut the end loop as evenly possible so that the threads in the warp are all able to maintain the same length. I don’t want any of my warp threads to be longer than others. I also leave the “choke” tie intact. That’s the dark thread you see wound around the end of the warp. 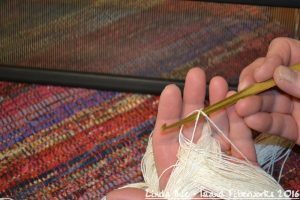 The “choke” tie’s job is to keep the ends of the warp secure so that no more than one thread at a time will pull out as you thread. 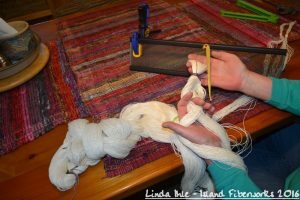 As you work you may want to tighten the choke tie occasionally to keep the warp threads secure. Once I’ve found the cross and cut the loop I’m ready to place the cross in my left hand and loop it around my thumb and middle finger as shown below to hold it and thread from. 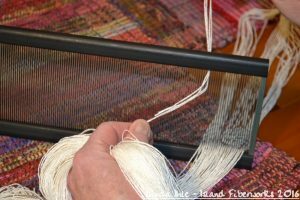 Now that I’ve got the warp cross open and spread in my hand I am able to see and pick up the top uppermost thread(s) from the warp and thread it through the reed. In my case for this workshop, I was threading the reed with two threads per dent, thus my pictures show me picking off two threads at a time. If I were threading the reed with one thread per dent I would pick up the upper most thread only. I pick the thread from the cross with my reed hook, then pull the threads from the warp and lay them over the reed. 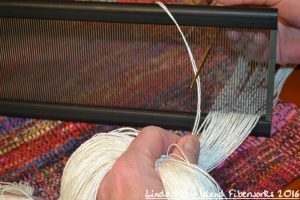 Then I insert the reed hook from the rear of the reed into the proper dent, grab the warp thread(s) and pull them through. As I thread the reed I tie the threads into bouts as I go. When I tie the bouts I try to keep the ends of the threads aligned as well as possible however if they become misaligned you can clean this up as you thread the heddles and re-tie the bouts. I like to tie my bouts using the same number of ends per inch of my draft so in this case each bout consisted of 24 threads as I my sett was 24 epi. 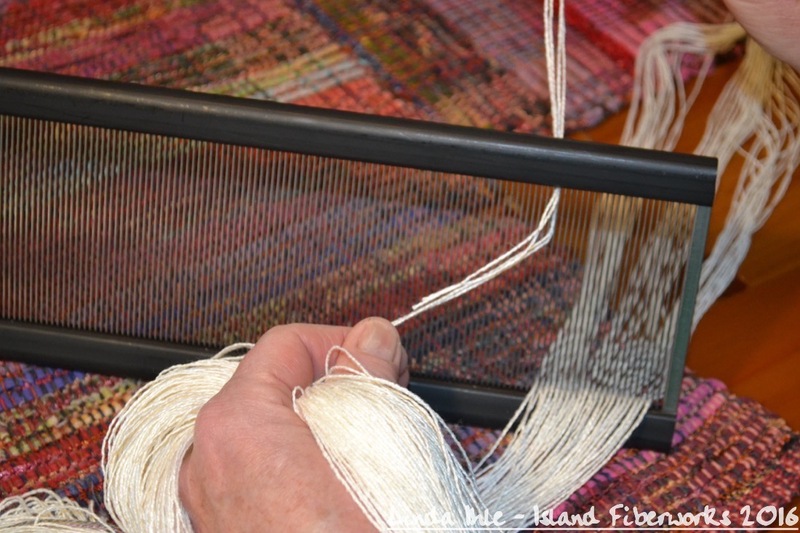 Once I’ve got my reed threaded I take it to the loom, insert it in the beater bar and get ready to thread the heddles. Here’s a link to a Youtube video I made of how I thread the heddles. Notice I’m dressing my brand new Schacht Wolf Pup 8/10 and I’ve got the loom folded up as I thread it. This brings the heddles up to eye level and makes them much easier to see and thread. Sometimes, instead of folding up the loom I will use two pieces of plywood to prop the harnesses up with. My plywood pieces are approx. 7″ wide x 7″ tall, I push up the harnesses and place one piece of plywood underneath them at each side. Enjoy and please don’t hesitate to contact me with questions!